Sister Helen Prejean, the internationally known speaker and author of Dead Man Walking, addressed a crowd of 300 at St. Edward’s University on Friday evening, October 12, as part of “Faithful Considerations: A Discussion with Sister Helen Prejean and Austin Faith Leaders”. Sister Helen was fresh from a trip crisscrossing California, speaking in churches to encourage voting for Proposition 34 to repeal the death penalty on the November ballot. “Faithful Considerations” was the third such discussion hosted by TCADP. 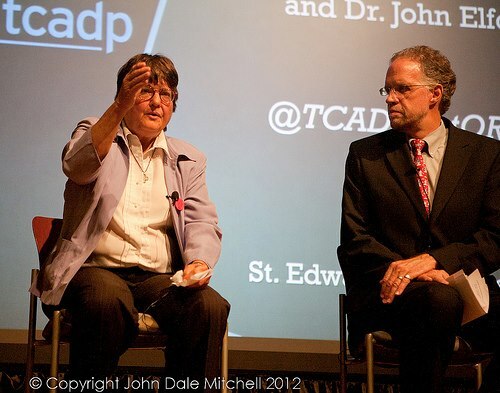 The Austin event featured a conversation between Sister Helen Prejean, Dr. John Elford, senior pastor of University United Methodist Church, and Pastor Nestor Menjivar, pastor of Principe de Paz Baptist Church. Dr. Elford was asked to be a part of the conversation due to his leadership and experience in tackling difficult issues while senior pastor at University UMC: “My fervent hope is that dialogue among Christians and practitioners of other religions will help us recover our voice as a people committed to peace and non-violence.” Pastor Menjivar has a long history of being involved in social justice issues and serving on the Board of the General Baptist Convention and Christian Life Commission. “I believe pastors and other religious leaders need to fully understand their God-given obligation and responsibility to teach God’s great mercy, which he calls us to show to others, especially those considered the least deserving,” he told TCADP. Both Dr. Elford and Pastor Menjivar shared that clergy can have a tendency to avoid difficult issues as they shepherd their diverse congregations, but they have also learned that people seem to hunger for that direction and real application of their faith to the world around them.